Over 100 key players from the mastic asphalt industry gathered at the Royal Horseguards Hotel in London to recognise and celebrate the year’s top projects, contractors and achievements as part of the annual MAC Awards.At one of the waterproofing industry’s most prestigious events, the Mastic Asphalt Council (MAC) – with support from sponsors SIG Roofing Supplies – met to honour its top professionals. From a field of outstanding entries, Southern Counties Roofing Contractors Ltd, Rio Asphalt & Paving Co. Ltd and Briggs Amasco Ltd scooped the three main awards. Bell Asphalt Company’s Keith Collins was also presented with a Research and Development Award. At one of the waterproofing industry’s most prestigious events, the Mastic Asphalt Council (MAC) – with support from sponsors SIG Roofing Supplies – met to honour its top professionals. From a field of outstanding entries, Southern Counties Roofing Contractors Ltd, Rio Asphalt & Paving Co. Ltd and Briggs Amasco Ltd scooped the three main awards. Bell Asphalt Company’s Keith Collins was also presented with a Research and Development Award. Having seen a previously applied liquid system debond from the asphalt, peel and flake off, the Hackney Decent Homes Management team reverted to the estate’s original, tried and tested waterproofing system – mastic asphalt. Applying 800 tonnes of mastic asphalt, Southern Counties Roofing Contractors Ltd utilised a total of 32 fully trained asphalt layers to successfully deliver the project over a 13 month period. Lifting the Challenge Cup at the event was Briggs Amasco Ltd. Recognised for a high quality waterproofing application at the regeneration of Stanhope Street in Newcastle – Briggs Amasco Ltd has already completed three phases of the project with the fourth and final phase set for completion in 2013. Appointed to prevent water ingress in and around the communal and private balconies, Permaphalt polymer modified roofing was installed at the 4000m2 project. Briggs Amasco Ltd completed the full waterproofing specification, as well as a series of associated works, on budget, on time and whilst the flats were fully occupied – making the project and the specialist contractor worthy winners. Rio Asphalt & Paving Co. Limited was also recognised at the event, picking up the Green Award for an outstanding contribution in the sustainable redevelopment of Hawbush Primary School, West Midlands. Helping the project achieve a BREEAM ‘excellent’ rating for environmental performance, Rio Asphalt & Paving Co. Ltd applied 1100m2 of mastic asphalt, metal decking and 550m2 of green sedum roof, as well as photovoltaics and sunpipes. With environmental performance a prerequisite, mastic asphalt was chosen for its 100% recyclability, non-toxic properties and long term durability. As work was carried out on a live school, great care was taken to ensure safety was paramount whilst the application caused minimal disruption. Rio Asphalt & Paving Co. Ltd’s contribution to the project helped to transform an ageing, ordinary 1950s school into a high specification building which will serve the community for many years to come. Special congratulations were also given to Keith Collins of Bell Asphalt Company, when he received the Research and Development Award for continued commitment and dedication in the development of mastic asphalt terrazzo flooring – introduced at the 2011 MAC Awards ceremony. MAC presented two of this year’s qualifying trainees with a personal cheque for £1,000 – this award is given to each fully qualifying craft trainee entering the industry. These awards are given in recognition of the trainees’ achievement in reaching the high standard of workmanship that the industry demands. 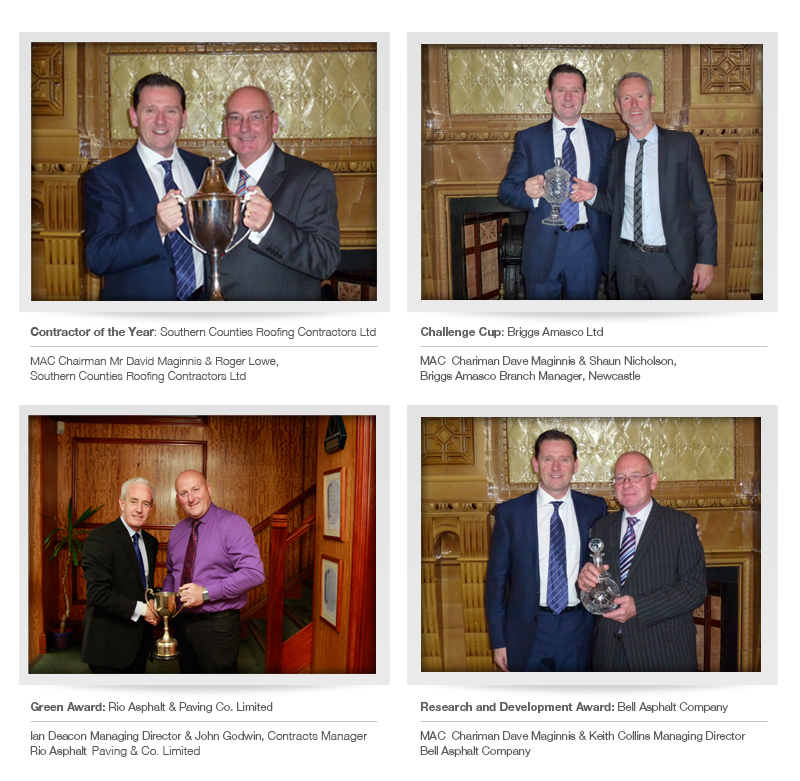 Every year the MAC Awards are organised and held by the Mastic Asphalt Council, a non-profit making independent body for which quality products, design and workmanship are fundamental requirements. MAC represents more than 90 companies of the UK’s top mastic asphalt contractors and leading manufacturers.